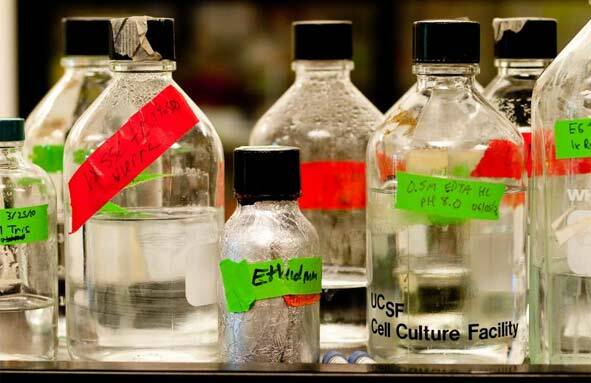 SOURCE: Flickr/Inkyhack Vials sit in a lab where researchers are using black widow genes for applications in car tires, body armor, seat belts, and airbags. The Presidential Commission for the Study of Bioethical Issues convened last week for its first meeting. The commission—created by executive order with the “goal of identifying and promoting policies and practices that ensure scientific research, healthcare delivery, and technological innovation are conducted in an ethically responsible manner”—was tasked by President Barack Obama to study first the implications of synthetic biology. The president’s request came on the heels of J. Craig Venter’s announcement that his lab had successfully created a single-cell organism with a genome synthesized entirely from scratch. The promise of the field of synbio as a whole is that scientists will be able to employ this type of genome synthesis to create customized life forms for a wide array of purposes. The peril is exactly the same as the promise. Rising to this demanding task, committee chair Amy Gutmann, president of the University of Pennsylvania, led a constructive conversation by asking pointed questions and periodically distilling the major points of contention and agreement among the various discussants. Drew Endy of Stanford University, a pioneer of synthetic biology, praised the meeting as the best conversation on synthetic biology that he has ever seen. The reason, he said, was that the most striking development over the course of the two-day conversation was its shift from simply avoiding the risks of synthetic biology to carefully harnessing its benefits in a way that is attuned to broader global challenges. Jim Thomas of the ETC Group, a Canadian green civil society organization, prompted this major turn in the conversation towards synbio’s global socio-economic implications by emphasizing the economic displacement that takes place when a new technology like synthetic biology enters the global economy. For instance, a synbio technology that allows an industry to grow an organic product in a vat for a lower cost than it could on the land would destroy the livelihood of thousands of farmers the world over. Thomas’s position was distinctly green and scientifically prohibitionist since he advocated a moratorium on the commercial or environmental release of synthetic biology products. Indeed, upon further questioning by the commission, it seemed as if he were advocating more of a ban than a moratorium since he could not arrive at a concrete “bottom line” for the safety and equity standards that synbio would have to meet for the moratorium to be lifted. He suggested the creation of new “social technologies” for assessing the social and economic impacts of technology and building democratic consensus among global populations. He noted that there is currently no democratic way of allowing the release of synbio technology, to which Dr. Gutmann retorted that there is no democratic way of banning it either. Assumptions about nature being benign or harmonious automatically stack the deck against any biotechnologies. Since risk can never be completely eliminated, Buchanan encouraged the commission to educate the public about risk management, its costs, and the importance of institutional designs that create the incentives for accurate risk management. And he did agree with Jim Thomas’s suggestion that effective institutions will require the development of new “social technologies.”An emphasis on social technologies seemed to appeal to the commission and many of the presenters as a new frontier for promoting scientific innovation in a way that is safe, responsible, and democratically accountable without over-relying on top-down regulation. More controversially, Buchanan clarified the meaning of “dual use” by subdividing it into two types. The more commonly understood form of dual use is the possibility that terrorist groups or rogue states could misuse a technology like synbio, but Buchanan also proposed that “good” actors or states could use synthetic biology for offensive purposes in the name of defending themselves. As an example, he pointed to the grossly unethical human radiation experiments perfumed by the U.S. government from 1944 to 1973. Buchanan concluded by encouraging the commission to focus on these concrete risks and benefits and not get bogged down with more intrinsic unanswerable questions about human nature, the meaning of life, or the implications of biological materialism for human moral agency. He was clearly asking for the commission to be decisively pragmatic in its recommendations for managing the risks and benefits of synbio without completely ignoring various theoretical views and approaches. During the audience Q & A period, Gerald Epstein of American Association for the Advancement of Science reminded the commission that synbio will only be one component of much larger issues that humanity faces and that and it should try to analyze the implications of synbio for social justice, human security, or the environment “as a whole.” These discussions moved the conversation toward an emphasis on concrete risks and benefits of synbio for a diverse and complex global environment. The second day of the meeting continued to place synthetic biology in this broader context. Paul Wolpe of Emory University reminded the commission that humans create technology that then goes on to recreate human existence—examples of this range from the plow, to the car, to the Internet. He speculated on the numerous effects that synbio can have on human lifestyles and humankind’s conception of itself, but he eventually zeroed in on the contrast between the value that humans place on speed and the human impulse to respond to technology incrementally. He also cautioned that this positive view of synbio’s capabilities be tempered with a wisdom that avoids fetishizing science by over-relying on arguments based on utopian visions or a hyperbolic sense of urgency. So, not only must the commission focus on managing concrete risks and benefits in a global environment, it must understand those risks and benefits in terms of the diverse cultural and religious values held by many of the world’s populations. The commission must also be humble enough to understand that common beliefs about the beneficent power of science and society’s ability to grapple with its implications as possessing their own biases and limitations. This line of discussion made the meeting as a whole very productive. It elucidated many of the most compelling arguments for a positive, risk management-based, globally-contextualized, culturally self-aware, and pragmatic approach. By coupling this approach to the specific safety and oversight concerns of scientists, business leaders, government officials, and everyday citizens, the commission can find a way to be open to various views of scientific progress while also being critical of them as it makes concrete recommendations. This is what a bioethics commission should be doing, paving a confident path through the ethical forest while respecting the great variety of the trees. Michael Rugnetta is a Research Assistant to Jonathan Moreno for the Center for American Progress’s Progressive Bioethics Initiative and Science Progress. The Presidential Commission for the Study of Bioethical Issues convened last week for its first meeting. The commission—created by executive order with the “goal of identifying and promoting policies and practices that ensure scientific research, healthcare delivery, and technological innovation are conducted in an ethically responsible manner”—was tasked by President Barack Obama to study first the implications of synthetic biology. The president’s request came on the heels of J. Craig Venter’s announcement that his lab had successfully created a single-cell organism with a genome synthesized entirely from scratch. The promise of the field of synbio as a whole is that scientists will be able to employ this type of genome synthesis to create customized life forms for a wide array of purposes. The peril is exactly the same as the promise. Rising to this demanding task, committee chair Amy Gutmann, president of the University of Pennsylvania, led a constructive conversation by asking pointed questions and periodically distilling the major points of contention and agreement among the various discussants. Drew Endy of Stanford University, a pioneer of synthetic biology, praised the meeting as the best conversation on synthetic biology that he has ever seen. The reason, he said, was that the most striking development over the course of the two-day conversation was its shift from simply avoiding the risks of synthetic biology to carefully harnessing its benefits in a way that is attuned to broader global challenges. Jim Thomas of the ETC Group, a Canadian green civil society organization, prompted this major turn in the conversation towards synbio’s global socio-economic implications by emphasizing the economic displacement that takes place when a new technology like synthetic biology enters the global economy. For instance, a synbio technology that allows an industry to grow an organic product in a vat for a lower cost than it could on the land would destroy the livelihood of thousands of farmers the world over. Thomas’s position was distinctly green and scientifically prohibitionist since he advocated a moratorium on the commercial or environmental release of synthetic biology products. Indeed, upon further questioning by the commission, it seemed as if he were advocating more of a ban than a moratorium since he could not arrive at a concrete “bottom line” for the safety and equity standards that synbio would have to meet for the moratorium to be lifted. He suggested the creation of new “social technologies” for assessing the social and economic impacts of technology and building democratic consensus among global populations. He noted that there is currently no democratic way of allowing the release of synbio technology, to which Dr. Gutmann retorted that there is no democratic way of banning it either. The dialogue prompted Allen Buchanan of Duke University to provide a more tech-positive counterpoint to Thomas’s claims about the vulnerability of the global environment. Buchanan argued that objections about “playing god,” “interfering with nature,” or “altering human nature” are often used to smuggle in assumptions about nature being inherently harmonious, stable, or balanced. He explained that nature is in a constant state of flux and that evolution is an imperfect process that “at most…fleetingly approximates maximal biological fitness.” Assumptions about nature being benign or harmonious automatically stack the deck against any biotechnologies. Since risk can never be completely eliminated, Buchanan encouraged the commission to educate the public about risk management, its costs, and the importance of institutional designs that create the incentives for accurate risk management. And he did agree with Jim Thomas’s suggestion that effective institutions will require the development of new “social technologies.”An emphasis on social technologies seemed to appeal to the commission and many of the presenters as a new frontier for promoting scientific innovation in a way that is safe, responsible, and democratically accountable without over-relying on top-down regulation. More controversially, Buchanan clarified the meaning of “dual use” by subdividing it into two types. The more commonly understood form of dual use is the possibility that terrorist groups or rogue states could misuse a technology like synbio, but Buchanan also proposed that “good” actors or states could use synthetic biology for offensive purposes in the name of defending themselves. As an example, he pointed to the grossly unethical human radiation experiments perfumed by the U.S. government from 1944 to 1973. Buchanan concluded by encouraging the commission to focus on these concrete risks and benefits and not get bogged down with more intrinsic unanswerable questions about human nature, the meaning of life, or the implications of biological materialism for human moral agency. He was clearly asking for the commission to be decisively pragmatic in its recommendations for managing the risks and benefits of synbio without completely ignoring various theoretical views and approaches. During the audience Q & A period, Gerald Epstein of American Association for the Advancement of Science reminded the commission that synbio will only be one component of much larger issues that humanity faces and that and it should try to analyze the implications of synbio for social justice, human security, or the environment “as a whole.” These discussions moved the conversation toward an emphasis on concrete risks and benefits of synbio for a diverse and complex global environment. The second day of the meeting continued to place synthetic biology in this broader context. Paul Wolpe of Emory University reminded the commission that humans create technology that then goes on to recreate human existence—examples of this range from the plow, to the car, to the Internet. He speculated on the numerous effects that synbio can have on human lifestyles and humankind’s conception of itself, but he eventually zeroed in on the contrast between the value that humans place on speed and the human impulse to respond to technology incrementally. Synbio will increase the speed of various biological processes, but humans will only come to understand it incrementally, not realizing the transformative potential of the technology until it has actually transformed our lives. It is this fear of incremental steps toward an irrevocable transformation of human existence that has underpinned some of the behavior-based religious systems and even the “playing god” objection. Wolpe recommended that the commission address synbio in “a positive way by creating goals and incentives rather than trying to stop things.” He also cautioned that this positive view of synbio’s capabilities be tempered with a wisdom that avoids fetishizing science by over-relying on arguments based on utopian visions or a hyperbolic sense of urgency. So, not only must the commission focus on managing concrete risks and benefits in a global environment, it must understand those risks and benefits in terms of the diverse cultural and religious values held by many of the world’s populations. The commission must also be humble enough to understand that common beliefs about the beneficent power of science and society’s ability to grapple with its implications as possessing their own biases and limitations. This line of discussion made the meeting as a whole very productive. It elucidated many of the most compelling arguments for a positive, risk management-based, globally-contextualized, culturally self-aware, and pragmatic approach. By coupling this approach to the specific safety and oversight concerns of scientists, business leaders, government officials, and everyday citizens, the commission can find a way to be open to various views of scientific progress while also being critical of them as it makes concrete recommendations. This is what a bioethics commission should be doing, paving a confident path through the ethical forest while respecting the great variety of the trees. Michael Rugnetta is a Research Assistant to Jonathan Moreno for the Center for American Progress’s Progressive Bioethics Initiative and Science Progress.